A quick glance at my news feeds online this morning left me with a pit in my stomach. It was a pretty balanced mix of the terrible and the beautiful with a splash of insanity for good measure. So goes the internet these days but it got me thinking about life because if you ask me, beautiful and terrible is a pretty great way to describe what it’s like to be a human. This weekend we decided to get away for some much-needed family time. 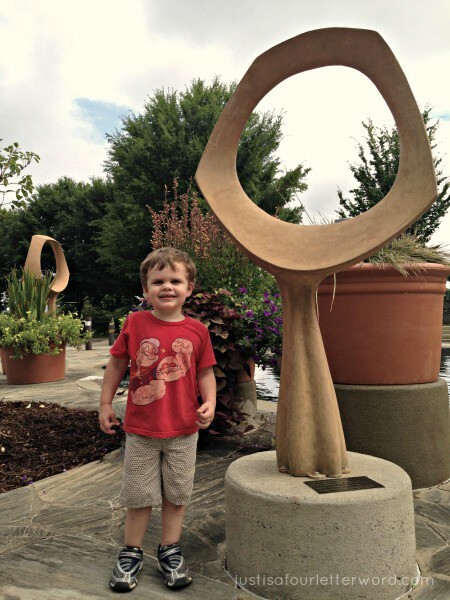 We love Raleigh and there are so many wonderful things here. However, there is something to be said for getting out of dodge. It’s far easier to let go when your chores are 4 hours away. I decided to break up the weekend into a few posts so check back for more of our adventures! We got a late start on Friday, but we made it to our little KOA cabin in one piece after driving through a crazy storm. The cabin was a far cry from the awesome experience we had at the beach earlier this year, but we were exhausted so we went right to bed. 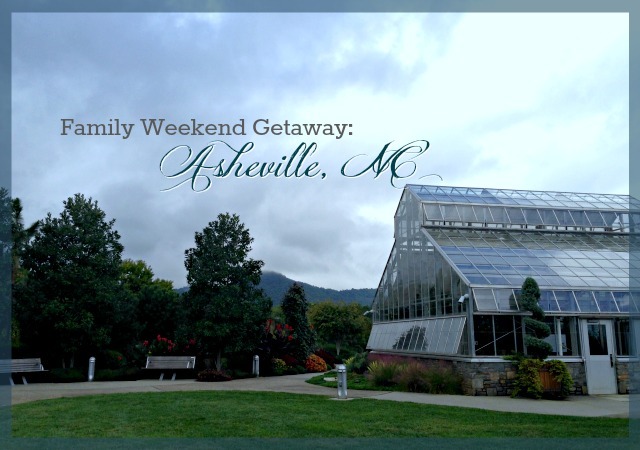 Jerry and I have been to Asheville before but we’d never taken the boys so I relied on recommendations from friends to make the most of our trip. Yay friends! We had an awesome time despite a rocky beginning. 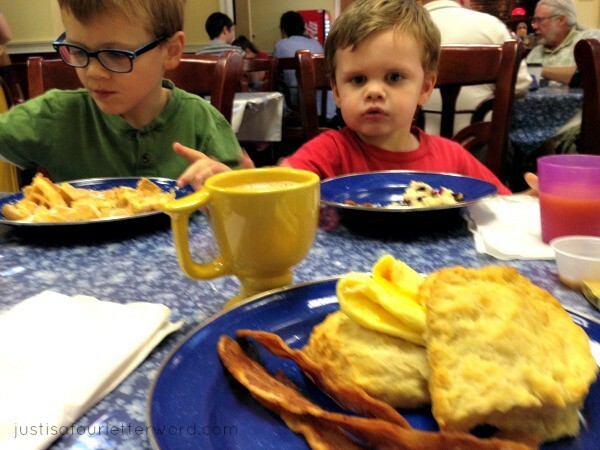 Since we were staying near Black Mountain, NC, we started our morning at Blue Ridge Biscuit Company and let me just say it was amazing! If you are ever in the area, this place is a must do for breakfast. The coffee was great and the food was delicious. They make their own biscuits in house and they are everything a biscuit should be! I will say it felt very quiet and calm in there, which was lovely, but it did feel like our loud and crazy kids stood out. That may just be on me though because no one made us feel unwelcome. 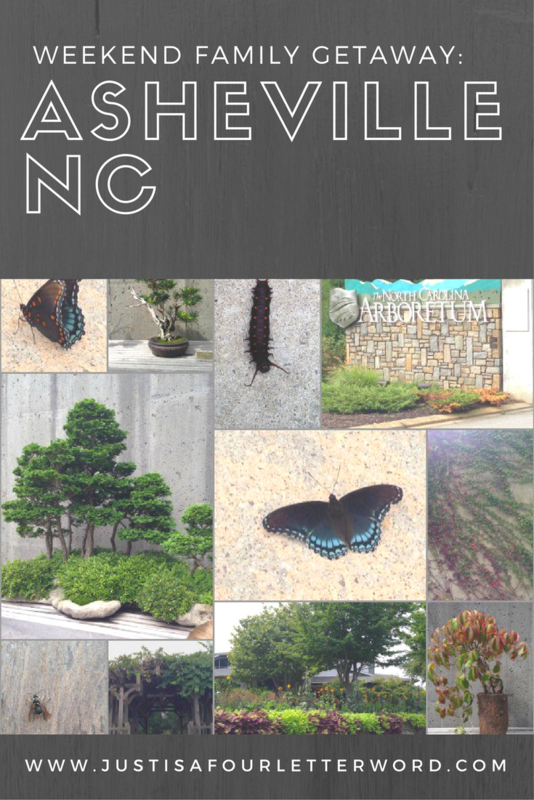 We decided to spend the morning at the NC Arboretum. 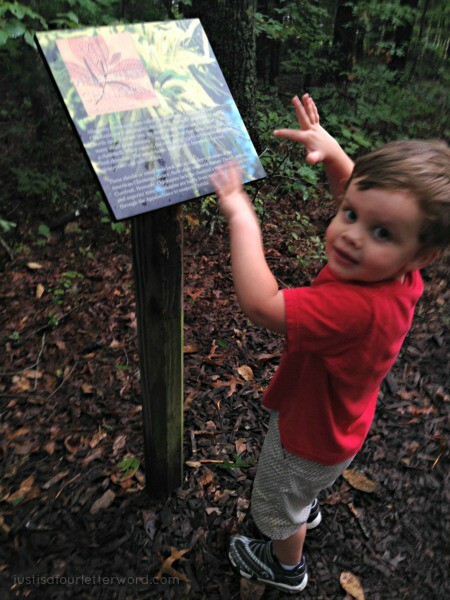 We started with a nature trail and Calvin immediately went up to this sign saying, look at my computer! You can take the technology away from the boy….. It was raining off and on but not enough to ruin our nice walk. 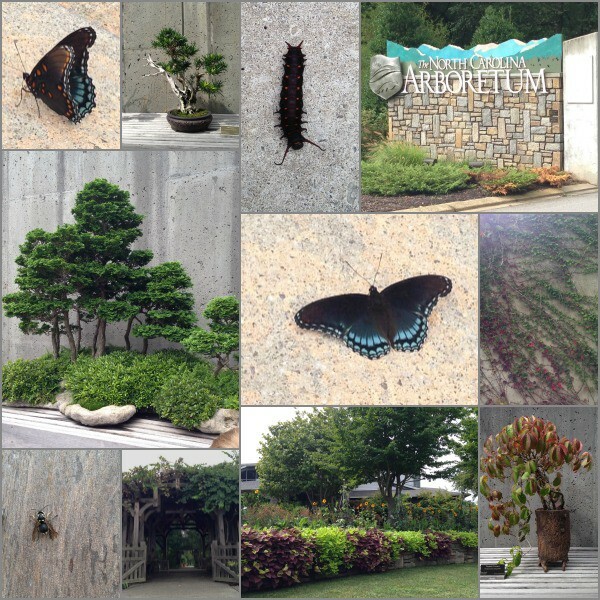 Jerry and I really loved seeing the gardens and the amazing Bonsai collection, but this one wasn’t a huge hit with the kids. They made the best of it and we rallied with a big cookie at the snack bar. One area of interest to all of us was this little fountain and waterfall spot outside the Bonsai gardens. 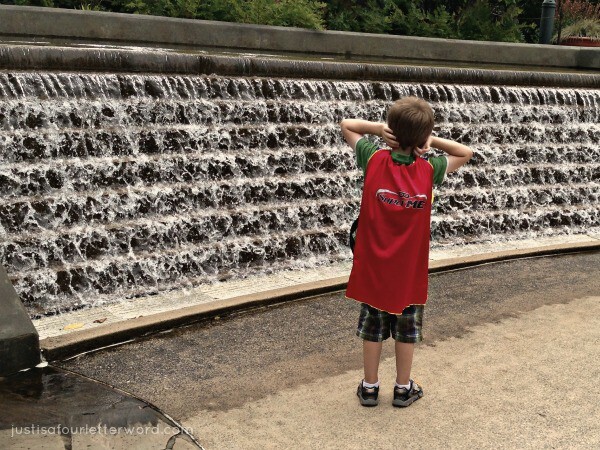 I can’t say I hate the fact that my boys thought the rushing water was too loud. At least that kept them from diving in! Life these days is all about balancing the beautiful and the terrible. 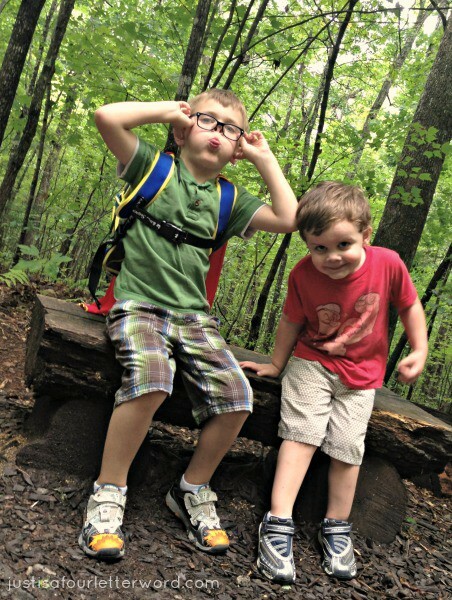 The beauty of running free outside with the annoyance of loud noises or whining children. Which parts will we focus on? What will we remember? It’s tempting to only see the hard things and join in the complaining chorus. We love to pick each other apart and talk about how hard life is or how wrong something is. And there is value in making judgement calls when needed so we can improve the things we have to offer the world. Our first morning in Asheville was much like this, going from whining and frustration to laughter and joy. Just moments before this photo, we were bombarded with demands and impossible behavior. Jerry had to give me a pep talk to stay positive and not let kids being kids ruin our time together. 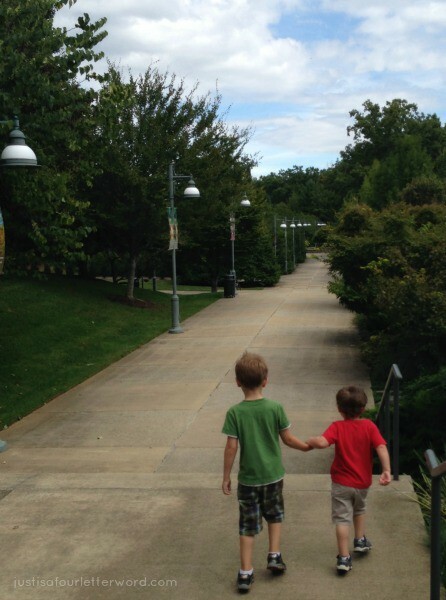 When I looked up I saw these two sweet boys walking hand in hand. Suddenly the terrible didn’t seem that bad and the beautiful was all I could see. So glad you all had a fun trip! 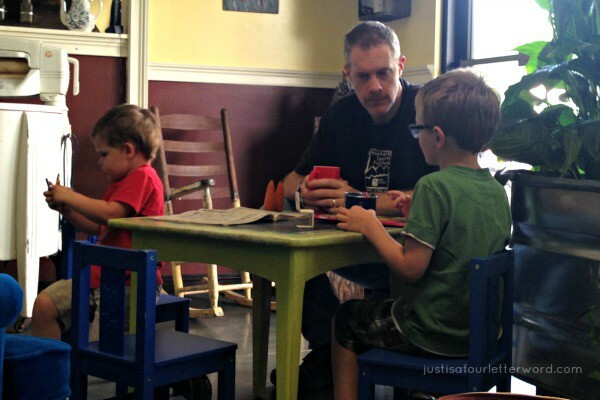 Parenthood is a constant mix of joy, exhaustion and so many other things. 😉 You do have me craving a biscuit now … and a giant cookie. Sometimes it is SO HARD to take a deep breath and let go of how you pictured things being so you can actually enjoy how they actually are. Glad you were able to do that!